On March 26, as Iranian-backed Houthi rebels appeared to gain the upper hand in Yemen, Saudi Arabia initiated a military campaign against Houthi rebels in support of President Abd Rabbuh Mansur Hadi. Saudi Arabia, which has long patronized Pakistan’s economy, military, and even nuclear program, wants Pakistan to support this gambit militarily. When Riyadh comes knocking in the twin cities of Rawalpindi (where the army’s general headquarters is located) and Islamabad (the seat of the civilian government and domicile of Pakistan’s intelligence agency, the Inter-Services Intelligence or ISI), ignoring the clamor is not an option. Last March, Saudi Arabia “gifted” Pakistan with $1.5 billion, and many analysts viewed this as essentially a down payment on Pakistan’s support for Saudi Arabia’s preferred policies in Syria. Pakistan’s powerful military—long accustomed to getting its way in Pakistan—has said that it wants to comply with Riyadh’s request. Prime Minister Nawaz Sharif, who has long-standing ties to the Kingdom, including a long exile in Saudi Arabia after General Musharraf seized power in October 1999, is also likely inclined to support the request. Even the “left-of-center” Pakistan Peoples’ Party has publicly stated that it supports the Saudi intervention in Yemen. Unfortunately, the civilian government and the army have hit a road bump: Pakistanis do not support entering this war. So to generate public support for this endeavor, the Pakistan army’s most loyal militant proxy, Jamaat-ud-Dawa (JuD), has stepped into the fray. The group, which was responsible for the 2008 Mumbai terrorist attacks among other outrages, has been using its social media and convening rallies across the country to mobilize public support for providing military assistance to the Saudi intervention in Yemen. This essay documents JuD’s messaging efforts by examining JuD’s various official Twitter feeds as well as the rhetoric that JuD deploys during its rallies. Jamaat-ud-Dawa was known as Lashkar-e-Taiba (LeT) until it was “banned” in 2002. Following the ban, the group simply reorganized itself under the new name. Most international analysts consider Jamaat-ud-Dawa (née Lashkar-e-Taiba) to be a terrorist organization that prosecutes the army and ISI’s agenda in India and, at different times, in Afghanistan. In contrast, many Pakistanis view JuD more as a philanthropic organization than a purveyor of terror at the state’s behest. What few analysts have generally understood is that JuD also plays a critical role in Pakistan’s domestic politics that derives from its close ties to Pakistan’s military and intelligence agencies. One of these important roles is that JuD, with its commitment to safeguarding the state, offers ideological and material competition to other violent groups in Pakistan. JuD also offers the important utility of street power through its ability to mobilize thousands of ordinary Pakistanis behind government policies. In its campaign to generate public support for Pakistani military assistance to Saudi Arabia, JuD’s messaging has pushed five themes: 1) it is the duty of all Muslims to defend Saudi Arabia, as it is the home of the two holiest sites in Islam; 2) the crisis in Yemen is the result of a Jewish-Crusader alliance out to destroy the Muslim holy places; 3) the Houthi rebels plan to attack imminently and thus Saudi Arabia is fighting a defensive war to protect the sacred sites; 4) the Muslim world must unite to fend off this menace; and 5) everyone in Pakistan supports this effort. JuD’s emir (leader) Mohammad Hafez Saeed has proclaimed at public rallies that it is the duty of every Pakistani, and indeed every Muslim, to protect the “harmain”—the Grand Mosque in Mecca, which surrounds the Ka`ba, and the Prophet’s Mosque in Medina—from a Houthi onslaught. JuD also argues that because of the presence of the harmain in Saudi Arabia, that country is the spiritual center for Muslims; thus, Saudi Arabia must also be protected against the enemies of Islam and of God who have conspired to create fitna (strife) on Saudi Arabia’s doorstep. On April 2, JuD announced that it had formed a new nationwide movement called “Pasban-e-Harmain-Sharifian” (Defenders of the Holy Sites) for the defense of the revered structures, aimed at generating support beyond JuD’s traditional support base. They set up a separate Twitter account and designed a special symbol to represent the movement, which JuD’s national twitter feed also adopted (see Figure 1). Saeed explained that under this banner JuD would gather the various political and religious parties on a single platform for the defense of the harmain. The logo is a remarkable piece of propaganda. In addition to featuring the Ka`ba, it references the poetry of Allama Iqbal, a Muslim political philosopher that Pakistanis revere alongside Muhammad Ali Jinnah, the so-called Father of Pakistan. In fact, Iqbal’s portrait appears along with that of Muhammad Ali Jinnah in Pakistani public buildings. 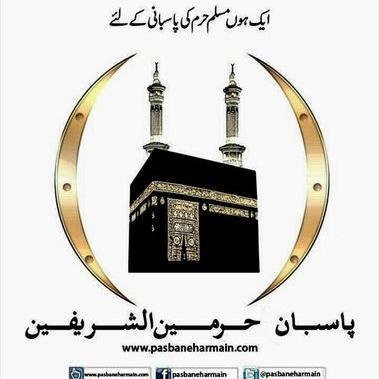 At the top of the logo is a well-known couplet from one of Iqbal’s most important poems, “Dunya-i Islam” (World of Islam), in which Iqbal implores Muslims to unite for the defense of the Ka`ba. The poem argues that the biggest impediment to Muslim unity is “racialism.” Ironically, though Iqbal thought parochial nationalisms undermined the strength of the umma (the global Muslim community), Pakistanis revere Iqbal because they believe he argued for a separate Muslim state. (Needless to say Iqbal’s corpus of writings cannot so easily be reduced to this demand as many Pakistanis believe.) JuD’s mobilization of this Pakistani revision of Iqbal’s call to Muslim unity is a clever and emotive strategy because most Pakistanis will recognize this line and immediately understand the message its use is meant to convey. A second theme that JuD propounds in its efforts to galvanize support for providing Pakistani military aid to Saudi Arabia is that, contrary to what the international and even Pakistani media claim, the conflict in Yemen is not sectarian and it is not about Iranian and Saudi competition; rather, the JuD claims that the conflict is a result of a conspiracy on the part of “the Crusaders and Jews” to destabilize Yemen. Sometimes the Crusaders are omitted. For example, on March 27, Saeed declared that that a “Jewish conspiracy” (yahudi sazish) has destabilized Yemen. Rather than characterizing Iran’s involvement in the conflict as “sectarian,” Saeed explained that Iran is involved because it is part of a “US and Zionist conspiracy” and castigated Iran for not representing the “Muslim world.” Incidentally, this supports JuD’s anti-sectarian commitments within Pakistan. Similarly, on April 3, Saeed explained to the people gathered at a public rally that the Houthi rebellion in Yemen is not a problem of “Saudi Arabia vs. Iran” or “Shi`a vs. Sunni;” rather it is due to a conspiracy waged by “Crusaders and Jews.” The concept of a nefarious “Crusader-Jew” alliance has considerable takers throughout the Muslim world. Indeed, Osama bin Laden himself alleged that such a nexus exists to harm Muslims. It also has salience in Pakistan. Even though the vast majority of Pakistanis have never met a Jew in their life, many Pakistanis are deeply anti-Semitic. Pakistan’s media spends considerable time dilating upon Israel’s treatment of Palestinians while paying virtually no regard to Arab maltreatment of the same. Many Pakistanis are susceptible to any number of conspiracy theories about “the Jews,” including, inter alia, that they: 1) run Hollywood; 2) run global finance; 3) dictate U.S. foreign policy; 4) are behind virtually every woe in Pakistan; and 5) were behind the events of 9/11. Pakistanis tend to conflate being Jewish with being Israeli and typically use “Jew” and “Zionist” interchangeably. In addition to believing that Jews are behind every malady in Pakistan, many Pakistanis believe that Jews operate in tandem with Hindus (sometimes referred to even more pejoratively as Brahmans or Baniyas) and the Crusaders (i.e., the United States). Ordinary Pakistanis, popular media personalities, and many in the military or government take it as fact that there is a “Zionist-Hindu-Crusader” nexus that seeks to impose any number of tragedies upon Pakistan. Lamentably, these themes are commonplace in Pakistani textbooks. JuD asserts that the Houthi rebels pose an imminent threat to the Muslim holy sites in Saudi Arabia. To protect them, Saudi Arabia is fighting a defensive war. On social media, JuD uses the hashtag #DefendingHarmain and phrases like “defending and protecting the harmain” to imply that the war is being fought inside Saudi Arabia rather than in Yemen (see Figure 2). Additionally, JuD claims that ISIS and the Houthi rebels are part of the same conspiracy, bent on destroying sacred sites. Pakistanis, like Americans, are not well versed in geography, and JuD has not used maps in their rallies. Portraying this offensive war in Yemen that was launched to protect Saudi strategic interests as a defensive war in Saudi Arabia to protect the harmain is a straightforward communication strategy that will resonate with Pakistanis, most of whom will know that the holy sites of Mecca and Medina are in Saudi Arabia even if they have no clue about Yemen and the complex web of woes ensnaring it. Another theme the JuD emphasizes is that only unity across the Muslim world can undermine this conspiracy. For this reason, the invocation of Iqbal’s call for all Muslims to unite to protect the sanctuary is particularly salient. Hafez Saeed told his followers that Muslims of all countries—including Pakistan—should worry more about the harmain than their own countries and the problems they confront. This message is particularly germane to Pakistanis given that Pakistan has been at war with itself since 2002. During a press conference at JuD’s headquarters in Khyber, Saeed told attendees that protecting the harmain is “a part of our faith” and that Pakistan should unite Muslim countries in their defense. In this vein, JuD exhorted Prime Minister Nawaz Sharif to unite Islamic countries in defense of the “Land of the Harmain” (Saudi Arabia) and called on him to present himself as the leader of the Muslim world. After all, Saeed argued, Pakistan is an atomic power and is thus at the center of defending the Muslim world and standing up the various world powers. Saeed also reminded Pakistanis that Saudi Arabia has always played a role in Pakistan’s defense (Saudi Arabia is widely suspected of funding Pakistan’s nuclear weapons program). JuD’s statements construct Pakistan as the “defense center” of the Muslim world and Saudi Arabia as the “spiritual leader.” In this way, Pakistan is obliged to defend Saudi Arabia against this threat, construed as a Jewish and Crusader alliance to mobilize Houthis against the holiest of Muslim sites. Of course, Saeed and the JuD conveniently tend to gloss over the fact that this war to “defend the Muslim world” will mostly involve killing other Muslims. Finally, many of JuD’s statements give the impression that the civilian government and military have already made the decision to militarily support Saudi Arabia and that the Pakistani public is behind the government’s decision. Figure 3 presents a typical JuD rally and concomitant tweet to this effect. The caption reads: “The people are ready to fight shoulder to shoulder with the Saudi government to protect the Holy Harmain!” The tweet also includes a photo of rally in which JuD activists, who are easily identified by the organization’s distinctive black and white flag, carry a sign that reads: “We strongly support the decision of the Pakistani government to protect the sanctity of the holy sites.” Extraordinarily, JuD claims that Pakistanis are ready and willing to sacrifice their lives in defense of the “Guardian of the Holy Sites”—that is, the king of Saudi Arabia. The reality is quite different. Pakistani opinion leaders have noted that Saudi Arabia is behind much of the terrorism that has ravaged Pakistan and has done little to attenuate Saudi-origin support for extremist madrassas that churn out students steeped in sectarian hate-mongering. Opponents have also rightly asked what Saudi Arabia has done to support Pakistan in its various internal and external military challenges. Moreover, Pakistan’s military has been fighting the Pakistani Taliban in the tribal areas for more than a decade, and the Pakistani Taliban receive support from Saudi Arabia (among others). Pakistanis—especially Shi`a—also worry that the sectarian-tinged war in Yemen will exacerbate the ongoing war being waged against Shi`a in Pakistan by Sunni militants with ties to Saudi Arabia. It is impossible to assess what the net impacts of JuD’s messaging will have on public opinion. And it should be remembered that JuD is not the only organization engaging in such efforts. Deobandi political religious leaders have also weighed in to support the move; Deobandis have influence over most of the militant groups operating in Pakistan and they have influence over most of the country’s mosques and madrassas. Mainstream Ahl-e-Hadis ulema (religious scholars) also support the move. Meanwhile, Barelvis and Shi`a oppose militant support for Saudi Arabia’s Yemen misadventure. Ultimately, the Pakistani state will decide after weighing numerous considerations, not the least of which is Saudi largesse. However, if the past provides any clues, the efforts of JuD will likely be significant. After all, JuD has an enormous domestic infrastructure, deep credibility among Pakistanis, and considerable street presence. Unlike its Deobandi counterparts who support this measure as part of their larger sectarian worldview, JuD espouses national unity. Even after the decision is taken, likely to support Saudi Arabia, JuD’s efforts will continue to shore up support for the controversial policy. No matter the ultimate outcome, JuD will use this opportunity to burnish its credentials with the deep state and further imbricate itself in Pakistan’s domestic and foreign policies.